Planetary geologist Paul R. Byrne explains how mapping plays a pivotal role in unlocking the secrets of Mercury, our solar system’s innermost planet. 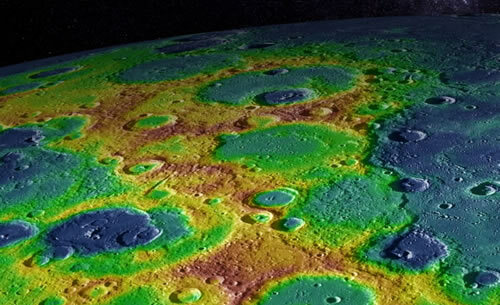 Byrne has used Esri ArcGIS software to map remotely sensed data collected by the NASA MESSENGER spacecraft. What have the maps revealed? Read the article. 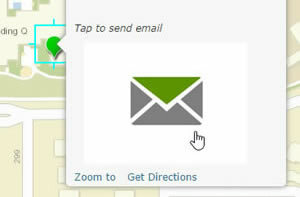 Web map pop-ups can be configured to send email back to you or your organization. It’s an excellent way for people who view your map to provide feedback or start a dialog. Read the tip. PlaceWorks, Inc., uses GeoPlanner for ArcGIS to help the City of Menlo Park, California, plan for the expansion of Facebook headquarters and an influx of tech employees. Read the article. Mapping your organization’s building interiors is a smart business move, improving everything from sales to staff productivity. Read the article. Time lapse animations in this Esri Story Map Journal show what scientists say is evidence of liquid water in craters on the planet Mars. View the Story Map Journal. The new version of Navigator for ArcGIS offers directions in nine languages besides English: French, German, Greek, Korean, Russian, Spanish, Japanese, simplified Chinese, and Portuguese. Read the article. Aaron Cheuvront from the University of Washington talks about how GIS is used to visualize and manage space on campus. Indoor mapping helps students find their classes and first responders reach the location of emergencies. Watch the video. Global terrain elevation data for use in 3D clients and high-resolution imagery are just two of the latest updates to Data Appliance for ArcGIS, a data and hardware solution that works behind your organization’s firewall. Read the article. The Living Wage Map, created by Esri using data from MIT professor Amy Glasmeier's Living Wage Calculator, shows the differences between the minimum wage and a living wage for a family of four, a single parent with one child, and a single adult. View the story map. Street data for 52 countries in the Asia Pacific region, including India, Indonesia, Hong Kong, Australia, New Zealand, and Malaysia, are now in StreetMap Premium for ArcGIS. Read the article. The ArcGIS Earth beta is available to take out for a spin. Esri's new desktop-based app gives you the ability to explore 2D and 3D data. Read the blog. Download the beta. Thousands of coders. More than 300 tech sessions. Good things will happen when the Esri Developer Summit returns to Palm Springs, California, March 8–11, 2016. Register today. Esri’s spatial analysis development team demonstrates a series of spatial statistics tools in ArcGIS, including Central Feature, Standard Deviational Ellipse, and High/Low Clustering. Watch the video. Your city can use GIS to analyze its public transit service, including finding out where the people underserved by the system live. Read the blog. View the Story Map Journal. Esri's Joseph Kerski used ArcGIS Online and ArcGIS Pro to map the altitude and other data from a student-launched weather balloon named Spartacus. Read the blog. Esri offers cost-effective solutions to US customers that want to configure or upgrade their GIS. Esri's server, desktop, mobile, and data products are prepackaged with ArcGIS. Search for a solution. Bet you have a remarkable GIS Day story to tell! Did you make mapping apps, create a story map, or have a blast taking part in the Ashcloud Apocalypse megavolcano exercise? Send in your story and photos. Follow scientists as they conduct biodiversity research on the Ogooué River in Gabon, Africa, using a Story Map Journal created by The Nature Conservancy. The scientists collected data about fish, the habitat, and the water. View the Story Map Journal. Watch the video.